Are you bored of ordinary wedding stationery? Do you think all wedding invitations look the same? Your stationery can set the tone for you entire wedding, so why not get inspired by our unique designs and ideas. Our Wedding Design Service offers unique stationery to reflect the personalities of individual couples, in a move away from the generic, mass produced designs that have become the norm. Our service is a bespoke service offering beautifully designed invitations and accompanying elements to give your wedding a consistent theme and style. 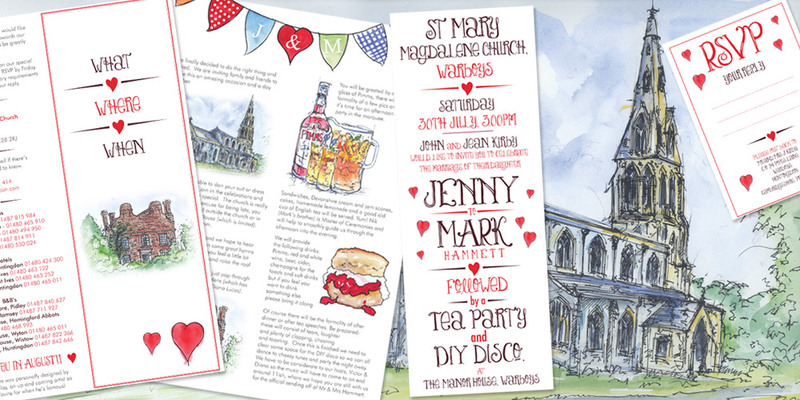 “Thank you so much for all you have done for us, we are so pleased with how the invites and Order of service looked. Everyone commented and said they had never seen anything like it before. The response has been mega. The Manor House loved the picture too, we had it mounted and framed and it was a big hit, they weren’t charging us for the use of their gardens, so it was a really personal thank you gift. The vicar wants to use the church illustration and has kept an invite and order of service as he said its the best he’s seen. Ewen, we cannot thank you enough, you have been brilliant and very patient when I have been painfully asking to make to changes.